The FUSION Foundation would like to introduce and explain the ‘Time-Lock’ function that will be enabled on the FUSION Blockchain. ‘Time-Lock’ is a revolutionary FUSION innovation unparalleled in traditional or digital finance and will serve as a foundational component of cryptofinance. Importantly, FUSION is not fundamentally changing the value of money but using technology to express value more accurately. This technology is currently under patent application. The following article will provide a brief explanation of the FUSION ‘Time-Lock’, more extensive documents will be shared in the future that delve further into the technical and financial complexities of what is discussed below. Time-based values are a tricky concept because we are accustomed to the following thinking: If we have 100 ETH today, then we have it forever so long as we do not transfer it. We have it today, and next month, and in a year, and also in 100 years. And as long we have not traded this value, in each of these time points, it is ours to use. A concept introduced in any elementary Finance course is the concept of the ‘time value of money’. Fundamentally, the ‘time value of money’ explains that one dollar today is worth more than one dollar at some point in the future, say a year later because of its potential earning capacity. This is true because one dollar today can be invested in a risk-free asset, say a government bond and can earn interest over the course of the one year period. Today, there are two essential parameters that define traditional transfers of value, Type ($USD, BTC, FSN) and Quantity ($10.00, 5 BTC, 3.5 FSN). FUSION’s innovative ‘Time-Lock’ function creates a third parameter of value, ‘Time’. Using the ‘Time-Lock’ function, a value, say 10 FSN, can be ‘split’ into defined periods, for example from the present time until 3 months (0, 3 months) and from 3 months until infinity (3 months, ∞). This ‘split’ has created two tradable time-based values that are defined by three parameters:, Type, Quantity and Time. The model for a time-based value is as follows: Quantity (Q), Value (V), Start time (T1) and End time (T2), (Q, V, T1, T2). At this point it is important to distinguish between two important terms in consideration of time-based values, the ‘Owner’ and the ‘User’. We might distinguish the ‘Owner’ and the ‘User’ by following this guideline: The ‘Owner’ will possess a given value from time (T) until infinity (∞), whilst the ‘User’ value will posses a given value from time T to time T2, where T2 ≠∞. This means that the ‘User’ does not really own this value but only has the right to use it for a fixed time period before those rights are returned to the ‘Owner’. Returning to the concept introduced previously the ‘Time Value of Money’, we explained that value of $100 USD is different if owned over various time segments, owned today, vs in 1 year vs in 100 years. This can easily be expressed in our proposed 3-parameter notation. Let’s take the example of $100 USD over two time segments: The value of (100, $USD, 0, 6 months) may be 2% of $100, and the value of (100, $USD, 6 months, ∞) may be 98% of $100. The price given to each time-based value would be set by the market and would represent the expected upside of holding the USD$100 from the present until 6 months. There is no simple way to achieve future value transfers using existing smart contract architecture. This is primarily true for two reasons. One, future transfers through smart contracts rely on the triggering of external conditions and thus cannot unequivocally guarantee a future payment. And two, smart contracts cannot enable the beneficiary of a future payment to transfer this future value to a third party before it has been received. 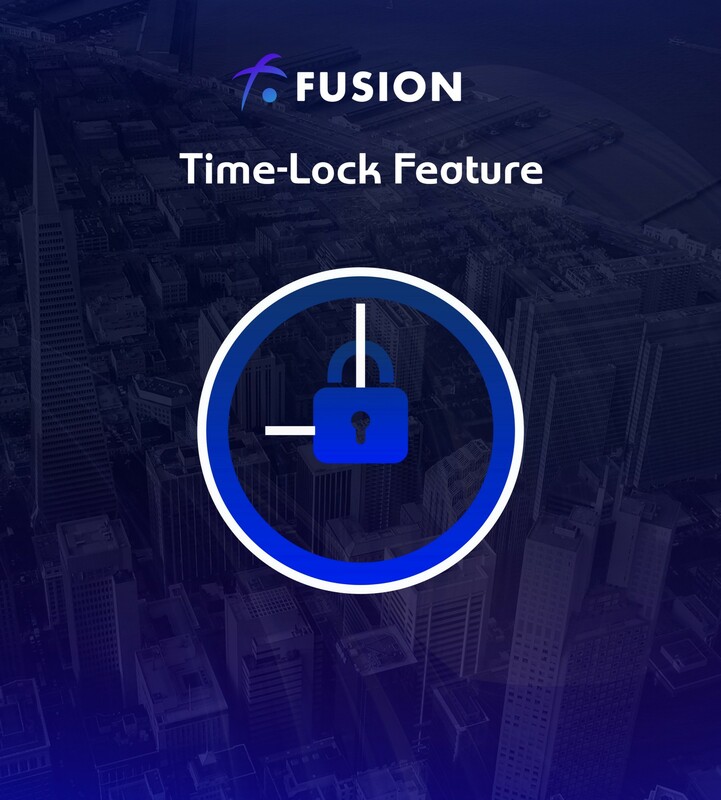 FUSION’s ‘Time Lock’ function solves the above stated problems and enables complete security and automation across future value transfers that have never been possible in cryptofinance. We look forward to sharing more information on the FUSION ‘Time-Lock’ function and other important FUSION innovations in the future.